When sisters Sharon and Sherilyn Kramer attend a wedding in Shipshewana, one of them returns with a new penpal while the other returns to her job at the bakery. After sending weekly letters back and forth, Sherry and Graham Holland arrange a reunion in Pinecraft. Upon Graham s arrival, however, he realizes he s been writing to the wrong sister. He decides to use the reunion as a way to get to know both sisters, but can he sort through the confusion in time to turn the worst vacation ever into something truly wonderful? Arianna is counting down the days until her wedding to Jesse. They have been friends longer than Arianna can remember, and that friendship turned into love over the past couple of years. But when Arianna s brother Isaac, who happens to be Jesse s best friend, gets them both into trouble, Arianna s father puts an end to her engagement to Jesse. Some summer storms pass quickly, but Arianna is afraid the damage from this one may be too much to repair. Esther has always lived in the shadow of her beautiful younger sister Sarah. Even the boy she has known and loved her entire life, Judah, only has eyes for Sarah. But when a handsome young Englischer comes to live with the family for a summer, everything begins to change. 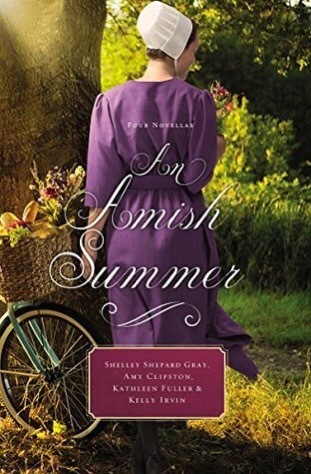 An Amish Summer is a collection of novellas from four of my favorite Christian writers. These writers are beyond talented. When I read each novella, I felt like I was only reading five pages…the plot flew by that fast. I was deeply engaged. Entertaining from the beginning to end. The endings for each piece were beautifully done. I was surprised. Sometimes, I didn’t think certain situations were going to work out…then, to find that they did. I was hooked. I would love to write a review for each novella, but I’m afraid that I’ll give too much away. Shelly Shepard Gray’s A Reunion in Pinecraft was a perfect summer Amish tale. Young Amish men and women met that summer. New beginnings. Tender, sweet, and messy. I loved it. Amy Clipston’s Summer Storm was brilliant too. A young Amish man and woman loved each other for along time. This tale was a coming of age read. The young Amish man had a lot to learn. His love, patiently waited for him. Their love was inspiring. Kathleen Fuller’s Lakeside Love was an eye opener. I found that their is much more to our outside looks than originally thought. Those of us who don’t have the good looks on our side can easily relate to the Amish sister who was deemed plain by all. Hearts of gold were found in this sweet read. Overall, An Amish Summer was packed full of clean yet engaging stories. They were well-written. The characters were different as the sun and moon. But each one has similar issues. Issues revolving on finding the one for them. Love comes and goes. It surprises us when we least expect it to…I highly recommend this Amish collection to readers worldwide.